Dimensions 0 by 7 by 10 in. Re-architect relational applications to NoSQL, integrate relational database management systems with the Hadoop ecosystem, and transform and migrate relational data to and from Hadoop components. This book covers the best-practice design approaches to re-architecting your relational applications and transforming your relational data to optimize concurrency, security, denormalization, and performance. Winner of IBMÃ¢ÂÂs 2012 Gerstner Award for his implementation of big data and data warehouse initiatives and author of Practical Hadoop Security, author Bhushan Lakhe walks you through the entire transition process. First, he lays out the criteria for deciding what blend of re-architecting, migration, and integration between RDBMS and HDFS best meets your transition objectives. Then he demonstrates how to design your transition model. Hadoop/NoSQL solutions do not offer by default certain relational technology features such as role-based access control, locking for concurrent updates, and various tools for measuring and enhancing performance. Practical Hadoop Migration shows how to use open-source tools to emulate such relational functionalities in Hadoop ecosystem components. Database developers, database administrators, enterprise architects, Hadoop/NoSQL developers, and IT leaders. Its secondary readership is project and program managers and advanced students of database and management information systems. 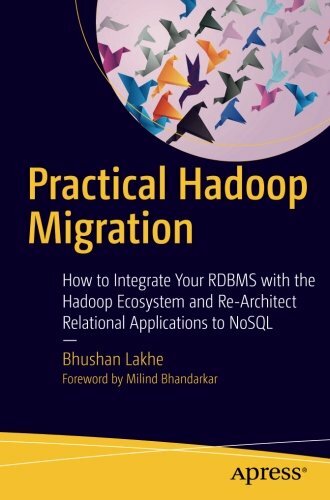 About: Re-architect relational applications to NoSQL, integrate relational database management systems with the Hadoop ecosystem, and transform and migrate relational data to and from Hadoop components.